Where does Organic Acacia come from? How is it produced? The sap from which Organic Acacia is produced comes from two species of acacia which meet the criteria for organic farming: wild Acacia senegal (L.) and Acacia seyal Delile (3). These two species grow abundantly in Saharan Africa (the Maghreb, Mali, Senegal, Sudan …). The exudate is produced in the trunk and branches when the tree is subjected either to tapping or to natural cracks in the bark caused by the wind, dry conditions, parasitical plants or foraging insects. The gum starts to form when the resin seeps out of these cuts and comes into contact with the air. Once harvested, the sap hardens and then undergoes fine liquid purification to eliminate any impurities (mineral or organic). The resulting syrup is briefly sterilised at high temperature, then dried and converted into a highly-soluble powder, and packaged for use in measured doses. What are acacia gum’s mechanisms of action? Acacia gum contains 90-97% soluble fibre – plant-based carbohydrates that are resistant to salivary and intestinal digestive enzymes as well as to oral and gut flora. They reach the colon intact, at which point they’re confronted with more than 400 different species of bacteria which co-exist inside us. These bacteria include species which are able to use the dietary fibre as fuel to increase their growth. They’re called probiotics and are known to have beneficial effects on many of the body’s functions. In vitro studies have shown that of the various types of bacteria that populate the colon (beneficial and pathogenic), strains from the Bifidobacterium genus are most able to use acacia gum for their growth (4). This is a genus involved in the prevention of several diseases and in maintaining general health. What’s more, when this fibre is broken down, metabolites are produced which themselves have a positive effect on other beneficial species: short-chain fatty acids, produced by bifidobacteria, stimulate the growth of bacteria that produce lactic acid. This virtuous circle goes even further since by promoting a growth in beneficial bacteria, there is greater protection against colonisation of the milieu by pathogenic bacteria (5). stimulation of metabolic activity (production of short-chain fatty acids, and lowering of the luminal pH) (6). What does research say about acacia gum? Scientists are extremely interested in soluble fibre, acacia gum in particular, for an increasing number of applications. Not all these applications are unanimously recognised by the scientific community, either because it is a new field and researchers are only at the initial stages of their investigations, or because studies so far conducted have sometimes proved contradictory, are insufficiently precise, have questionable methodology or concern sections of the population that are too specific. According to several studies (mainly in vitro (7-8)), supplementation with acacia gum is associated with a rise in numbers of Bifidobacteria in the colon. Wyatt et al noted a significant increase in Bifidobacteria populations in the colon of a volunteer following supplementation with 10mg/day of acacia gum (9). This effect was subsequently confirmed in a blind study of 10 healthy volunteers who took either 10g/15g of acacia gum for 10 days, or a placebo 10. The effect was more pronounced in subjects who had fewer than average bifidobacteria at the outset. Bifidobacteria inhibit the growth of pathogenic bacteria, both as a result of their natural development, as well as their ability to lower colon pH (11). Two in vitro studies (12) demonstrated the potential effect of acacia gum on the growth of bacteria from the Clostridium genus and on production of their corresponding toxin. acetate may be used more by peripheral tissue. In a number of in vitro (13-14) and animal (15-16) studies, acacia gum fibre was shown to produce an increase in SCFAs, though results have been less clear in humans. Some researchers put this down to the difficulty in adequately recording fatty acid levels, as they tend to be rapidly absorbed by colon cells. Thus two studies (17-18) failed to demonstrate a rise in SCFAs following daily supplementation with either 25g or 6g of acacia gum. As a result, acacia gum is not officially recognised as providing the beneficial effect of increased production of SCFAs for healthy populations as a whole. Dietary fibre is recognised as helping to reduce calorie intake by increasing the feeling of satiety: in absorbing water, soluble fibre expands and produces a physical sensation of satisfaction in the stomach (19-21). help in maintaining normal cholesterol levels. Are there any risks or contraindications associated with taking acacia gum? In 2001, the French government officially recognised acacia gum as a dietary source of soluble fibre (in the same way as Psyllium blond). Data from clinical studies refers to its excellent digestive tolerance: incidence of flatulence, bloating and the abdominal cramps which often occur with soluble fibre are rare with acacia gum. This is because it is broken down more slowly by bacteria than most other prebiotics and because fewer fermentation compounds are produced (hydrogen, methane, carbon dioxide) than with FOS (22). Taking 10g/day (2 scoops) produces no changes in the number of stools or faecal weight. Reports of allergic intolerance to acacia gum are extremely rare. Since animal studies have shown that acacia gum may enhance lipid metabolism due to an antioxidant effect and improve capillary function, researchers were interested in its potential effects on the visceral adiposity index. This is both an indicator of fat distribution and of increased risk of abdominal obesity and hypertriglyceridaemia. Their study (25) involved 100 type 2 diabetics, 50 of whom took 30g/day of acacia gum, and 50 a placebo. In those taking the supplement, levels of HDL (‘good’) cholesterol increased by around 20%, while there no change was seen in the placebo group. Triglyceride levels remained unchanged in both groups, while the visceral adiposity index decreased by 23.7% in those taking the acacia gum. These findings support the conclusions of three other studies (one human (26) and two animal (27-28)), which demonstrated a potential anti-obesity effect from acacia gum. The researchers believe their results could be explained by possible improvements in insulin sensitivity and glucose homeostasis (29). None of the authors declared any conflict of interest in relation to this study. Two doses of acacia gum and fructo-oligosaccharides (another antibiotic) were tested over 48 hours in an artificially-recreated colon model (with the same pH, temperature and bacterial strains as are found in the human colon). Samples were taken at the start of the test, then at 5 hours, 10 hours, 24 hours and 48 hours. Fermentation of acacia gum was found to promote Bifidobacteria and Lactobacillus spp, a group of beneficial bacteria30. The effect lasted for 10 hours, and even as much as 24 hours, which could be evidence of slow fermentation, as suggested by previous studies31. At the same time, the number of the pathogenic bacteria Clostridium histolyticum decreased during fermentation, supporting several existing theories. Finally, production of SCFAs, particularly acetate, propionate and butyrate, also increased. The effects of the fructo-oligosaccharides were similar to those of acacia gum. Why is Organic Acacia more expensive than other forms of acacia gum? There are more than 30 species of gum-producing acacia but only Acacia senegal (hard gum) and Acacia seyal (friable gum) produce good quality gum, (Acacia senegal being of superior quality to Acacia seyal). The sap from which Organic Acacia is produced comes from these two species and is certified 100% organic. Because it is high quality, producers can command a better price for it, which is reflected in the cost of the end product. Why is Organic Acacia not produced in Europe? The trees which produce acacia gum prefer sandy soil and high temperatures throughout the year. It is therefore not possible to produce acacia gum of European origin. What is the molecular weight of acacia gum? It is between 300 and 800 kDa. Can Organic Acacia be combined with anything else? As a supplement, acacia gum is often combined with other substances such as Mastic Gum or probiotics. Those wishing to benefit from a liver detox at the same time can also take Desmo Forte™ or LIV 52®. 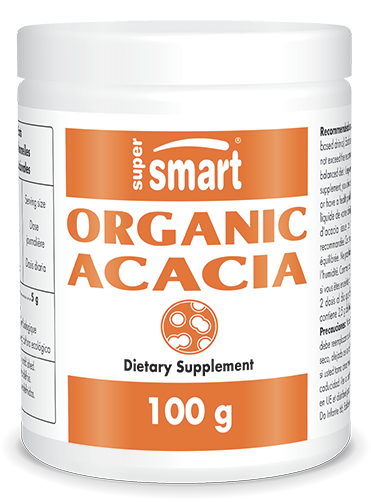 Does Organic Acacia need to be refrigerated? Prebiotics are resistant to heat which also preserves them throughout the manufacturing process and means they can be incorporated into any dish. Is production of Organic Acacia harmful to the environment? The gum tree actually serves to protect and improve the soil in which it grows: its highly-branched root system protects the soil from erosion and stabilises the dunes. It also helps fertilise it by providing a significant amount of nitrogen, phosphorus and proteins under its crown. Its contribution to the recycling of chemical elements has been the object of several studies (32-33). Do the excisions made on the tree cause irreversible damage? The acacia is a robust tree: after it is tapped, it will recover as soon as the first rains arrive (34). Is production of Organic Acacia harmful to local populations? Production of acacia gum requires the involvement of rural populations: the revenue it generates for them supplements what they make from the sale of cotton, cereals and farming. These are regions where for 9-11 months of the year, drought conditions can exist and thus the inhabitants rely increasingly on these resources, especially as all the parts of the tree can be used by farmers (leaves, pods and fruit), either for animal feed, fuel, or as fertiliser. Should I expect to get any side-effects from taking Organic Acacia? In vitro studies suggest that fermentation of acacia fibre is relatively low and would not be expected to cause any unwelcome side-effects in healthy individuals35. What’s the best dose to take? Significant effects appear to be induced by 10-15 g/day (36). One randomised, double-blind study involving 96 volunteers showed that a dose of less than 6g/day produced a barely significant increase in bifidobacteria compared with a control group. On the other hand, high doses will certainly cause side-effects such as diarrhoea or digestive discomfort (37). Two scoops (2 x 5g) provide around 40% of the recommended daily amount of fibre (25 g). A minimum of two scoops a day is therefore recommended, diluted in a drink of your choice (water or a plant-based drink), to be taken preferably before food. Does Organic Acacia contain GMOs? No, it is certified non-GMO and organically-produced. It is also suitable for vegans and those following a low FODMAP diet. 2. GIBSON G.R., PROBERT H.M., LOO J.V., RASTALL R.A., ROBERFROID M.B., Dietary modulation of the human colonic microbiota : updating the concept of prebiotics. Nutr. Res. Rev. 17 : 259-275, (2004). 3. CHERBUT C., MICHEL C., RAISON V., KRAVTCHENKO T., SEVERINE M., Acacia gum is a bifidogenic dietary fibre with high digestive tolerance in healthy humans, Microbial Ecology in Health and Disease, 15: 43 -50, (2003). 4. SALYERS AA. et al., Degradation of polysaccharides by intestinal bacterial enzymes. Am. J. Clin. Nutr. 31:S128-130, (1978). 6. MICHEL C., KRAVTCHENKO T.P., DAVID A., GUENEAU S., KOZOLOWSKI F., CHERBUT C., In vitro prebiotic effects of acacia gums onto the human intestinal microbiota depends on both botanical origin and environmental pH. Anaerobe 1998;257-66. 7. MARZORATI M., QIN B., HILDEBRAND F., KLOSTERBUER A., ROUGHEAD Z., ROESSLE C., ROCHAT F., RAES J., POSSEMIERS S., 2015. Addition of acacia gum to a FOS/inulin blend improves its fermentation profile in the simulator of the human intestinal microbial ecosystem (SHIMEV R). J. Funct. Foods. 16:211–222. 8. TERPEND K., POSSEMIERS S., DAGUET D., MARZORATI M. 2013. Arabinogalactan and fructo-oligosaccharides have a different fermentation profile in the Simulator of the Human Intestinal Microbial Ecosystem (SHIMEV R). Environ. Microbiol. Rep. 5:595–603. 9. WYATT T.M., BAYLISS C.E., HOLCROFT J.D., A change in human faecal flora in response to inclusion of gum arabic in the diet, British Journal of Nutrition, 55, 261–266, (1986). 13. BOURQUIN L.D., TITGEMEYER E.C., FAHEY G.C. Jr., GARLEB K.A., Fermentation of dietary fibre by human colonic bacteria : disappearance of, short-chain fatty acid production from, and potential water-holding capacity of, various substrates. Scand. J. Gastroenterol. 1993;28:249-55. 16. ANNISON G., TRIMBLE R.P., TOPPING D.L., Feeding Australian Acacia gums and gum arabic leads to non-starch polysaccharide accumulation in the cecum of rats. J.Nutr. 1995;125:283-92. 17. MCLEAN ROSS A.H., EASTWOOD M.A., BRYDON W.G., ANDERSON J.R., ANDERSON D.M., A study of the effects of dietary gum arabic in humans. Am. J. Clin. Nutr. 1983;37:368-75. 22. CHERBUT C., MICHEL C., RAISON V., KRAVTCHENKO T.P., MEANCE S., Acacia gum is a bifidogenic dietary fiber with high digestive tolerance in healthy humans. Microbial. Ecol. Health. Dis. 2003;15:43-50. 23. MCLEAN ROSS A.H., EASTWOOD M.A., BRYDON W.G., BUSUTTIL A., MCKAY L.F., A study of the effects of dietary gum arabic in the rat. Br. J. Nutr. 1984;51:47-56. 24. MCLEAN ROSS A.H., EASTWOOD M.A., BRYDON W.G., ANDERSON J.R., ANDERSON D.M., A study of the effects of dietary gum arabic in humans. Am. J. Clin. Nutr. 1983;37:368-75. 26. BABIKER R., MERGHANI T.H., ELMUSHARAF K., BADI R.M., LANG F., SAEED A.M., Effects of Gum Arabic ingestion on body mass index and body fat percentage in healthy adult females : two-arm randomized, placebo controlled, double-blind trial. Nutr. J. 2012;11(1):111. doi : 10.1186/1475-2891-11-111. 27. AHMED A.A., MUSA H.H., FEDAIL J.S., SIFALDIN A.Z., MUSA T.H., Gum arabic decreased visceral adipose tissue associated with downregulation of 11β-hydroxysteroid dehydrogenase type I in liver and muscle of mice. Bioact. Carbohydr. Diet Fibre. 2015;6(1):31–36. doi : 10.1016/j.bcdf.2015.06.004. 29. DREW B.G., RYE K.A., DUFFY S.J., BARTER P., KINGWELL B.A., The emerging role of HDL in glucose metabolism. Nat. Rev. Endocrinol. 2012;8(4):237–245. doi : 10.1038/nrendo.2011.235. 30. OUWEHAND A.C., TIIHONEN K., SAARINEN M., PUTAALA H., RAUTONEN N., 2009. Influence of a combination of Lactobacillus acidophilus NCFM and lactitol on healthy elderly : intestinal and immune parameters. Br. J. Nutr. 101:367–375. 31. RUSSELL D.A., ROSS R.P., FITZGERALD G.F., STANTON C., 2011. Metabolic activities and probiotic potential of bifidobacteria. Int. J. Food Microbiol. 149:88–105. 32. DEANS J.D., DIAGNE O., LINDLEY D.K., DIONE M., PARKINSON J.A., 1999. Nutrient and organic-matter accumulation in Acacia senegal fallows over 18 years. Forest Ecology and Management 124 :153-167. 33. DOMMERGUES Y., 1993. L’atelier sur les symbioses acacias. Bois et Forêts des Tropiques, 238 : 21-34. 34. GIFFART P.L., 1965. Étude des possibilités du Tchad en gomme arabique. Ministère de la Coopération, Paris, France, 98 p.
35. CHERBUT C., MICHEL C., RAISON V., KRAVTCHENKO T., SEVERINE M., Acacia gum is a bifidogenic dietary fibre with high digestive tolerance in healthy humans, Microbial Ecology in Health and Disease, 15: 43 -50, (2003).